John Kerry campaigns Sunday in Bowling Green, Ohio. In the survey, taken Friday and Saturday, Bush led Kerry 50%-46% among likely voters. Independent candidate Ralph Nader was at 2%. The survey showed Kerry losing 1 percentage point and Bush gaining 4 percentage points from a poll taken the week before the Boston convention. USA TODAY extended its survey to Sunday to get a fuller picture of what's happening. A Newsweek poll taken Thursday and Friday gave the Democratic ticket a 49%-42% lead. Over three weeks, that reflected a 4-point "bounce" for Kerry, the smallest ever in the Newsweek poll. Among registered voters in the USA TODAY poll, Kerry and Bush each had 47%. Bush was up 4 points, Kerry unchanged from the pre-convention survey. Analysts said the lack of a bounce may reflect the intensely polarized contest. Nearly nine of 10 voters say their minds are made up and won't change. "The convention, typically a kicking-off point for a party, is now merely a reaffirmation" of where voters stand, said David Moore, senior editor of the Gallup Poll. "In a race this tight, the polls are going to be all over the place," said Stephanie Cutter, Kerry's communications director. "Most importantly, voters now clearly trust John Kerry more than Bush to lead and defend America." But Matthew Dowd, chief strategist for the Bush campaign, said "history doesn't bode well" for Kerry. Since World War II, the three challengers who have unseated presidents held clear leads after their conventions. 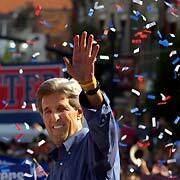 Kerry's acceptance speech Thursday was rated as "excellent" by 26%, a more positive response than Bush got in 2000. A 44% plurality said the Democrats were "about right" in criticizing Bush; 30% said they went too far. Views of Kerry's personal characteristics and leadership improved; views of Bush didn't change much. Bush's edge in handling terrorism was shaved to 12 points from 18. In a switch, Kerry now is trusted more to handle the responsibilities of commander in chief, by 51%-46%. Kerry's military service is seen as a plus. A 52% majority says it would help him be an effective president. More than one in four say it makes them more likely to vote for him.